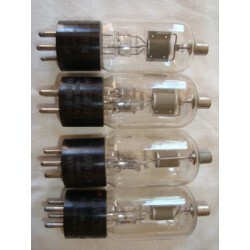 Fine audio frequency diode pentode tubes manufactured in the United States by renowned Raytheon. These sub-miniature glass tubes, wrapped in padded material, come with long wire leads, are printed in red RAYTHEON 1AJ5 MADE IN U.S.A. and coded 339. Boxes are standard red and blue Raytheon printed 1AJ5.